The University Archives provides a range of services. We hope these explanations of what we can and cannot do will make it easier for you to use our services. The University depends on information to develop programs and services, make critical strategic decisions, protect property rights, manage projects, serve students, and generate revenue. That information is contained in University records. Records can only be fully utilized as an asset if they are properly managed to enhance access to information and to reduce costs and risks. The University Archives helps busy staff manage University records by providing guidance on organizing, storing and disposing of records. Digital copies of the student newspapers are now online. Copies of old Observers, Case Techs, Reserve Tribunes, and other newspapers are available for online searching or free download. The blue image in the masthead depicts Adelbert Main (L) and Case Main (R), the first University Circle buildings of Western Reserve University and Case School of Applied Science, 1890. 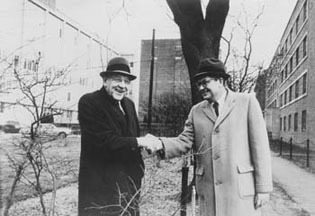 The black and white image depicts Western Reserve University President John Schoff Millis (L) and Case Institute of Technology President Robert W. Morse (R) shaking hands over the fence dividing their two campuses, signifying the agreement to establish Case Western Reserve University, 1967.